Brood Definition - What Is a Bird Brood? 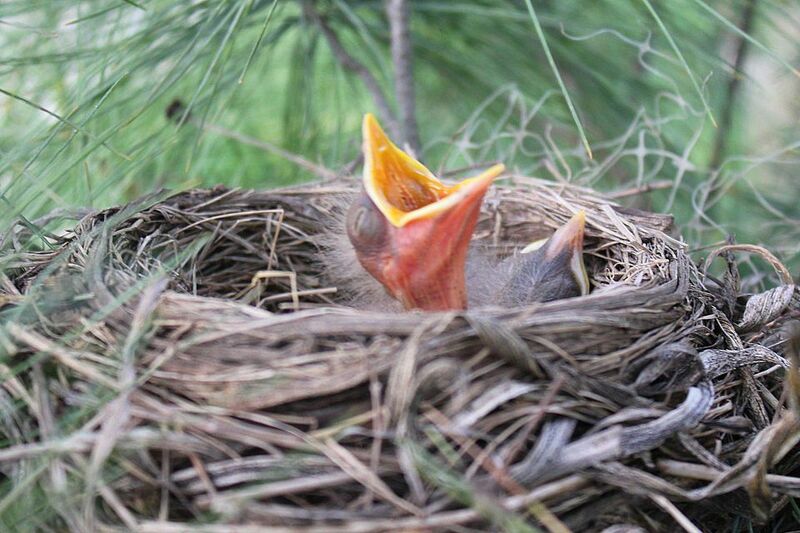 (noun) A brood is a set of young birds hatched at the same time by the same parents, a "family" of baby bird siblings. (verb) To brood eggs is to sit upon the eggs for the temperature regulation necessary for safe, successful hatching. Size: While the term brood is generally only applied to multiple chicks, bird broods can range from 1-15 or more eggs or chicks depending on the species. Precocial birds such as waterfowl and game birds generally have larger broods than passerines. Birds with very long chick care periods, such as albatrosses, raptors, and penguins, may have just 1-2 eggs per brood. Parentage: A brood is generally hatched and cared for by just one set of parents, but the exact parental structure of a bird family can vary. Some broods may include eggs from egg dumping species that lay eggs in communal nests and so the brood will have different genetic parents, even if only one set of parents is responsible for incubation and chick care. Polygamous birds may also have eggs from different parents in the same nest. For some bird species that lay multiple broods in one season, juvenile birds hatched in an earlier brood may remain in the family group to care for chicks from later broods. In these multi-generational arrangements, the broods are still considered separate even though the young birds may all share the same genetic parentage. Incubation Period: Some birds have very short brood periods and properly incubated eggs may hatch in just a few days. Other eggs may need delicate brooding for several weeks before they are mature enough to hatch properly. Even in the same bird species, the incubation period may vary slightly depending on ambient climate conditions, overall temperature, egg health, and other factors. Appearance: The individual egg size and shape, nest type and construction, egg stains, and even arrangement of eggs within the nest can all vary considerably between broods. These small clues can be great for helping to properly identify nests and eggs. Laying Interval: Many birds lay one egg per day and it may take several days to complete a brood, depending on how many eggs are part of the clutch. Some eggs may be laid more quickly, but could be less developmentally advanced and may not be able to hatch as safely or produce healthy hatchlings. Hatch Timing: Different eggs in the same brood may hatch at different times, depending on when incubation was begun. When the eggs are laid over a period of several days but full incubation does not begin until the brood is complete, all the eggs are likely to hatch within a few hours of one another. If incubation begins after the first egg is laid, however, later eggs will hatch later and the younger siblings will be at a disadvantage in the nest. One or both parents may brood eggs during the incubation period to keep them protected and warm until they are ready to hatch. In cases where both parents brood the eggs, it is common for one parent to do more of the incubation while the other parent gathers food and brings it to the nest for its brooding mate. Some birds do take turns, however, incubating eggs and sharing parental duties more equally. Specific nest construction to camouflage or conceal eggs, such as using mounds or cavities to keep eggs out of sight of predators or decorating nests to help hide the structure. Avoiding defecation, regurgitation, or other bodily functions at the nesting site in order to minimize odors that could attract the attention of hungry predators. Developing a bare patch of skin on the belly, called a brood patch, to improve the transfer of body heat to the eggs so temperatures can be regulated more carefully. Using specific postures or actions to regulate egg temperature, such as standing over eggs, using wings to shield hatchlings, or turning eggs regularly. Using distraction displays to lure potential predators away from nest sites, instead attracting dangerous attention to the protective adult rather than eggs or chicks. It can be a treat to have nesting birds raise their broods in the your yard, and birders can help ensure safe feathered families with simple steps. Provide bird houses of the appropriate size for desirable bird species to use. Take steps to keep bird houses safe, including discouraging predators. Offer appropriate shelter for non cavity-nesting birds and nestlings to use. Minimize disturbances to the nest and hatchlings to avoid stressing brooding birds. Offer a wide range of nutritious foods for parent birds to feed their hatchlings. Include calcium at backyard feeding stations to help birds form strong, healthy eggs.